How healthy are your dog’s bones? Canine bone health is reliant on a few things: diet, exercise, and weight management. Genetics play an important role too, but regardless of your dog’s predispositions, there are things you can do to help improve long term dog bone health. This is especially important for hunt dogs, who rely on their bones to carry them across long distances and varied terrain. Even the youngest, fittest, and most agile dogs need help maintaining healthy bones. The following tips can help all dogs enjoy a longer and healthier life with less pain and discomfort. Here’s to Maintaining Alpha Status-hunt on! Long hunting weekends put a lot of wear and tear on your dog’s joints, ultimately leading to bone deterioration. It’s so important to invest in a high-quality supplement with the right nutrients to support your dog’s joint and bone health. You know the classic song, “Dem Bones?” The one that goes, “Heel bone connected to the knee bone, the knee bone connected to the thigh bone..” All the bones in your dog’s body are interconnected, but it’s not just bones that hold the skeletal system together. There are lots of joints and other fibers responsible for keeping your dog’s bones strong and mobile. That’s why you need a supplement focused on more than just bones or joints, but the whole picture. Meet Free Range by Alpha Dog, a truly superior supplement made especially for hunting dogs. Free Range provides unmatched benefits to the spine, paws, elbows, hips and joints. For the best results, start feeding your dog a quality supplement for joint and bone health before you notice signs of limping or discomfort. Hunt dogs tend to get a lot of exercise by the nature of their job, but more than likely, you two don’t go out hunting every day. It’s important that your dog gets regular exercise, even on their off-days. Regular exercise improves muscular strength, which helps to support healthy bones. Obesity is frighteningly common in dogs. In fact, 1 in 3 dogs in America is overweight. Overweight dogs are at a greater risk for bone and joint issues. Maintaining a healthy diet with properly sized portions is the best way to deter bone and joint issues, as well as prevent aggravating pre-existing conditions. You might not even know if your dog is overweight. Talk to your veterinarian or do some research online to see if your dog falls in a healthy weight category. Annual checkups reduce your dog’s risk of expensive surgeries and reactive practices used to treat badly progressed joint or bone issues. It’s much better (and more affordable) to proactively treat your dog for joint and bone issues, which can only be accomplished by regularly visiting your vet and keeping careful tabs on slight changes to your dog’s health or mobility. 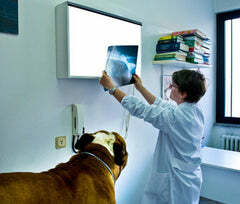 Young healthy dogs should visit the vet at least once a year. While senior dogs, or dogs with preexisting conditions, should visit the vet more frequently. You are what you eat, it’s no joke. 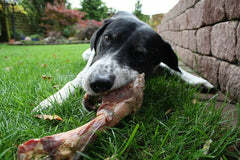 Your dog’s bones require certain minerals and nutrients, which come directly from the food he or she consumes. Make sure your four-legged pal is enjoying the benefits of high quality dog food packed with essential vitamins, minerals, lipids, and proteins. 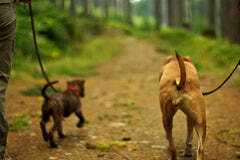 Your dog doesn’t want to finish daily walks, or shows resistance to physical activity they used to tackle without issue. Back legs are weak, shaky, or collapsing. Your dog is limping, especially after they first get up. Your dog is unable or unwilling to walk up or down stairs. Your dog is crying or howling at unusual times or for no apparent reason. Even if your dog is already experiencing serious pain or discomfort from bone or joint pain, it’s never too late to make diet and lifestyle changes to help improve quality of life. We are here to help any way we can!